Years ago I read Living in the Light by Shakti Gawain and loved it. I gave the book to my mom who called me when she finished reading it and said, "That's the way you live YOUR life!" Mom, she was right -- Shakti's book describes very well how I've always lived my life -- I just didn't know anyone else did it. I had never heard other people talk about living by intuition and heeding their own internal guidance system. I felt affirmed and validated after reading Shakti's book. 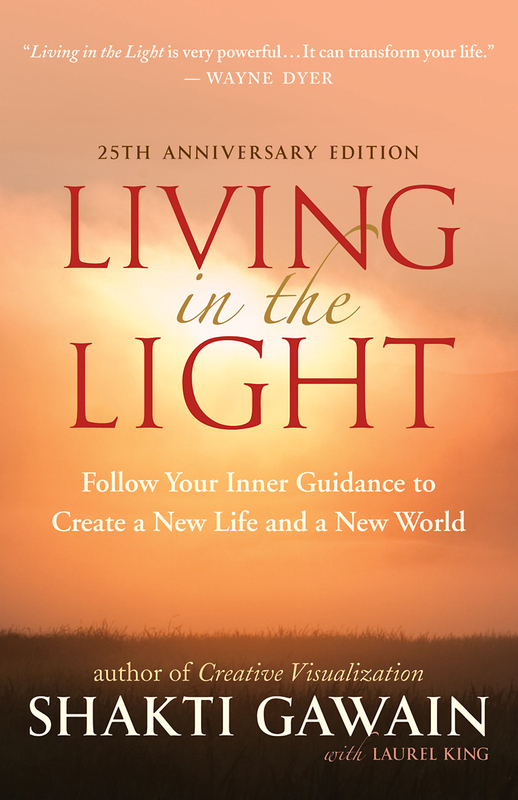 This year is the 25th anniversary of the publication of Living in the Light by New World Library, so I thought it would be interesting to check in with the author and see what she's up to lately. I figured it would be a real treat to interview an author who's been such a positive influence on my life, and tens of millions of other lives, too. BJ: What is it you want people to understand about how to "live in the light"? Shakti: We all have within us a deep wisdom, but sometimes we don't know we have it. We live in a culture that doesn't acknowledge or validate human intuition and doesn't encourage us to rely on our intuitive wisdom. Much of the Western world emphasizes rationality and reason, but overlooks or ignores the enormous value of intuition and instinctive wisdom. When I wrote Living in the Light, I wanted to share about how I live my own life and to encourage people to tap into their own inner wisdom. It's so practical to connect to that source of guidance on a day-to-day, hour-by-hour basis. Your intuition will tell you where you need to go; it will connect you with people you should meet; it will guide you toward work that is meaningful for you - work that brings you joy, work that feels right for you. Listening to your internal guidance system will lead to a rich, fulfilled, happy life. That's been my experience... and millions of folks can attest to it in their own lives as well. Of course life is not always easy and in fact, some are very difficult. This is all part of the process of being human. BJ: What's the relationship between your rational mind with your intuition? Shakti: Your intuition is not the same thing as your mind. In fact, intuition is really the opposite of your mind -- and you need to use BOTH in living your day-to-day life. The mind is the enemy of intuition, according to many New Age adherents, but I don't buy that. I look at everything in terms of polarities -- two ends of the same continuum. Young/old, male/female, individuality/conformity, work/play, freedom/constraint, right/left, day/night, life/death, rational/emotional, and so on. Mind and intuition are at opposite ends of the same continuum and our goal is to strike a healthy balance between the two. It's not a question of either/or... it's a question of both/and. We shouldn't ignore any guidance that comes from the mind - we should listen to our minds AND balance mental messages with intuitive messages. We need both to navigate our way through life. BJ: Care to talk about what you are working on these days? Writing a new book? Doing workshops? Shakti: Yes, yes, and yes! I'd love to talk about what I'm up to. The book I'm working on right now is on relationships -- about how we can use our relationships as paths to consciousness. By viewing our relationships with friends, family, and co-workers as mirrors, as teachers -- we see that they are reflecting back to us exactly what we most need to learn. I plan to finish the book this Winter for a Fall 2013 release. In addition to that book, I have a couple more I plan to write: The first is titled Write Your Book! for people who have a message to share and want to write a book. I believe that everybody needs to tell their story -- to be heard, to be seen, to be acknowledged, to be understood. We all want that, deep down inside -- and writing a book is a great way to make sense of your own experience and to share it with others. The other book I'd like to write is my own life story. I did one already, when I turned 40 and wrote Return to the Garden, but now I'm 63 so it's time to do it again. I think a lot of people will identify with it. BJ: I think so, too. A wise editor once told me: "That which is the most personal is also the most universal." So I'm sure that many people will identify with your life story. Shakti: I love that advice! "That which is the most personal is also the most universal." Perfect. BJ: What else is up next for your work in the world? Shakti: I'm very interested in the dialogue we have with the inner parts of ourselves. I've been influenced by the work of Hal and Sidra Stone and am developing ways to help people get in touch with the disowned parts of themselves. I conduct small, intimate, one-day workshops at my home once a month or so -- and I do individual coaching with people as well. A few years ago I took some time off to deal with a few health issues -- my body was letting me know it needed some attention and healing -- so I didn't write or do workshops for a while. But now I'm refreshed and renewed and my health has restored, so I'm having a wonderful time with the new direction of my work. I'm especially interested in relationships since that is a part of life that causes enormous pain for many people. When I was younger, relationships were a source of pain and frustration for me, too, and now I understand why. BJ: I love hearing your perspective on relationships! About 20 years ago I attended one of your workshops and recall how you said, "People who really want to be in a relationship are IN one." I'll never forget the impact your statement had on me. I have said for many years that I want to get married again, I want to have a life partner -- but when I look back over the years, my behavior tells me something different. I've had plenty of opportunities to get married -- I've dated dozens of great guys, and had some good relationships -- but somehow, they always ended. So... I suspect that while I SAY I want a man in my life, maybe deep down inside I really don't. Maybe I want freedom more than I want partnership. What do you think? Shakti: That's exactly the kind of thing I was talking about earlier in our conversation. Freedom and relationship are polar opposites -- they both exist on the same continuum. You DO want a relationship -- and you DO want freedom -- what you really want is BALANCE, you want wholeness. But there is some inner conflict -- fear, anxiety, some disowned part of yourself that is keeping you free, but also keeping you out of a relationship. That's exactly the kind of thing I help people with in my workshops and my coaching. The disowned parts of ourselves are what get in the way of us having the relationships we long for, the careers we don't know how to create, and the goals we want to achieve. It is by getting in touch with ALL the parts of ourselves -- by having a gentle dialogue with all the "selves" we have inside -- that we integrate them into a more comfortable, peaceful way of being with ourselves. We have to get good at being with ourselves before we can hope to be good at being in relationships with others.